Laws of 1779 and 1782. Most of these were comparatively recent arrivals. In 1807 a law was passed by the government of Finland ordering all the Jews in Finland to settle in the cities, where they were allowed to reside on securing passports as foreigners. There were at that time living in the country a number of Jewish families bearing Swedish names and recognized as Swedes. 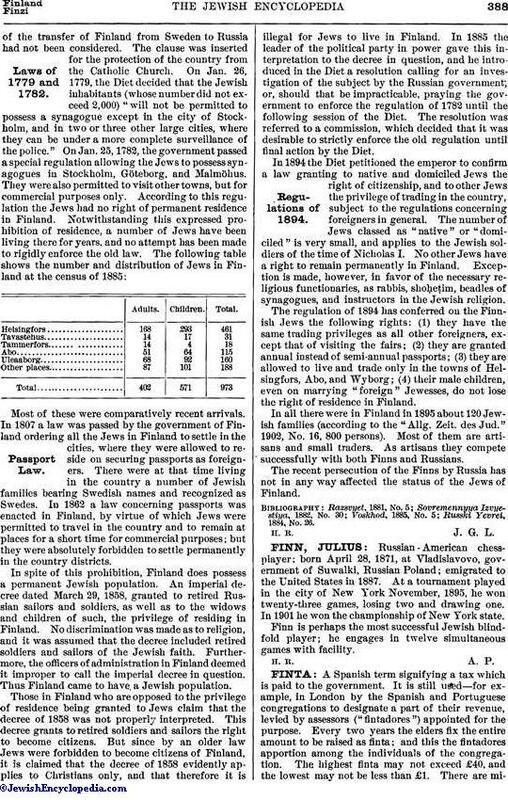 In 1862 a law concerning passports was enacted in Finland, by virtue of which Jews were permitted to travel in the country and to remain at places for a short time for commercial purposes; but they were absolutely forbidden to settle permanently in the country districts. In spite of this prohibition, Finland does possess a permanent Jewish population. An imperial decree dated March 29, 1858, granted to retired Russian sailors and soldiers, as well as to the widows and children of such, the privilege of residing in Finland. No discrimination was made as to religion, and it was assumed that the decree included retired soldiers and sailors of the Jewish faith. Furthermore, the officers of administration in Finland deemed it improper to call the imperial decree in question. Thus Finland came to have a Jewish population. Those in Finland who are opposed to the privilege of residence being granted to Jews claim that the decree of 1858 was not properly interpreted. This decree grants to retired soldiers and sailors the right to become citizens. But since by an older law Jews were forbidden to become citizens of Finland, it is claimed that the decree of 1858 evidently applies to Christians only, and that therefore it is illegal for Jews to live in Finland. In 1885 the leader of the political party in power gave this interpretation to the decree in question, and he introduced in the Diet a resolution calling for an investigation of the subject by the Russian government, or, should that be impracticable, praying the government to enforce the regulation of 1782 until the following session of the Diet. The resolution was referred to a commission, which decided that it was desirable to strictly enforce the old regulation until final action by the Diet. In 1894 the Diet petitioned the emperor to confirm a law granting to native and domiciled Jews the right of citizenship, and to other Jews the privilege of trading in the country, subject to the regulations concerning foreigners in general. The number of Jews classed as "native" or "domiciled" is very small, and applies to the Jewish soldiers of the time of Nicholas I. No other Jews have a right to remain permanently in Finland. 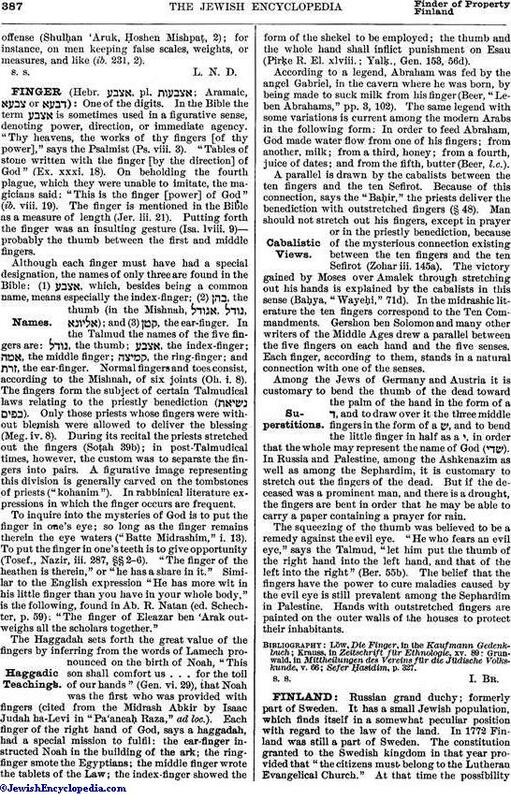 Exception is made, however, in favor of the necessary religious functionaries, as rabbis, shoḥeṭim, beadles of synagogues, and instructors in the Jewish religion. The regulation of 1894 has conferred on the Finnish Jews the following rights: (1) they have the same trading privileges as all other foreigners, except that of visiting the fairs; (2) they are granted annual instead of semi-annual passports; (3) they are allowed to live and trade only in the towns of Helsingfors, Abo, and Wyborg; (4) their male children, even on marrying "foreign" Jewesses, do not lose the right of residence in Finland. In all there were in Finland in 1895 about 120 Jewish families (according to the "Allg. Zeit. des Jud." 1902, No. 16, 800 persons). Most of them are artisans and small traders. As artisans they compete successfully with both Finns and Russians. The recent persecution of the Finns by Russia has not in any way affected the status of the Jews of Finland. Russki Yevrei, 1884, No. 26.